Fisherman’s Landing Bar & Grill is located within the JW Marriott Desert Springs mega resort in Palm Desert. Don’t let the resort hotel location scare you off though as Fisherman’s checked all our boxes that we look for in a restaurant. Prior to opening this new location at the JW Marriott, the owners opened and still operate several popular Fisherman’s Market & Grill restaurants with three here in Palm Springs, Palm Desert and La Quinta. My husband Bill and I always enjoyed the food but we didn’t care that much for the self-service setups. The new Fisherman’s Landing Bar & Grill offers diners a choice of sit down service in the large bar area or you can opt for self-service in the main dining room. Bill and I headed for the bar where we were promptly greeted and offered both dinner and bar food menus with extensive selections. I enjoyed a fabulous Fisherman’s special salad featuring charbroiled Mahi-Mahi, cold jumbo shrimp and crab over fresh romaine with and red cabbage, tomatoes and shredded carrots. Bill raved about his Baja Fish Taco’s with beer-battered Alaskan Cod that was lightly fried and topped off with Pico de Gallo Salsa and Fisherman’s famous white sauce. 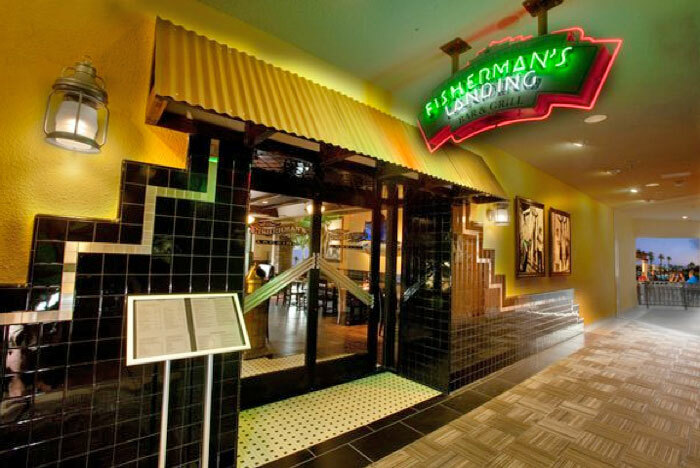 Fisherman’s offers a wide selection of fish, sandwiches, pastas, salads and soups. And for landlubber’s they also offer steaks, chicken and lamb chops and a special children’s menu. Fisherman’s features a large outside deck overlooking the resorts pool and grounds. Inside, abundant windows provide good views from both the bar and dining areas. And for a large resort hotel we actually found Fisherman’s prices to be quite reasonable. I highly recommend Fisherman’s Bar & Landing and Bill and I will be returning throughout the year. Parking tip. The resort valet parking is expensive, but you can have your valet ticket validated in the restaurant for free parking. If you haven’t visited this large resort you’ll want to spend some extra time exploring or taking a boat ride.